Large parties are intimate, and small ones don’t offer much privacy. F. Scott Fitzgerald’s character obviously didn’t form that observation while on a luxury yacht – I decided after spending three nights on Rascal, a modern phinisi built for leisure travelers, adventure divers and, with the owner-operator’s newly formed partnership with Conservation International, marine scientists. There were six of us guests on board, and ten crew members to see to our needs, a ratio that promised great comfort if nothing else. We made up a diverse group, brought together by a need to get away for a while, hopefully someplace exotic, luxurious and out of roaming-call range. Someone in our party, we learned soon enough, was eager to explore the seabed, another to work on her tan, and yet another to catch up on her reading, but somehow always retreated to her cabin for a nap. A blogger and her photographer-partner wanted to do a number of things. Meanwhile, I was prepared to get out of everyone’s hair, sit in a corner, and read. 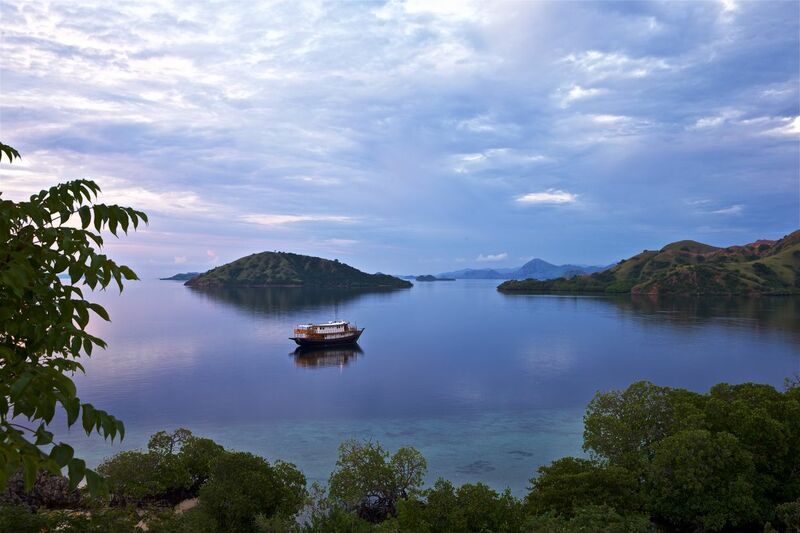 Our flights converged at Bandar Udara Komodo, a ‘work-in-progress’ in Labuan Bajo – a small farming village on its way to becoming a busy port town where expeditions to the nearby islands of Rinca and Komodo, and the islets around Flores were launched. We got off the plane, walked across the tarmac and waited with the rest of the crowd in the air-conditioned arrival hall until our luggage appeared one by one on the temperamental conveyor belt. Cold towels appeared as we waited for the transfer to Rascal, which was docked at the Labuan Bajo Port, a random collection of sheds and covered paths at the bottom of what will likely become the main tourist drag. Give it time. There was grime and confusion and heat, and it was a great relief to see all of us finally collected on a speedboat and on our way to the phinisi. Well-known resorts and independent yacht companies operate their own phinisi with accommodation, services, and itineraries tailored to guest requirements. 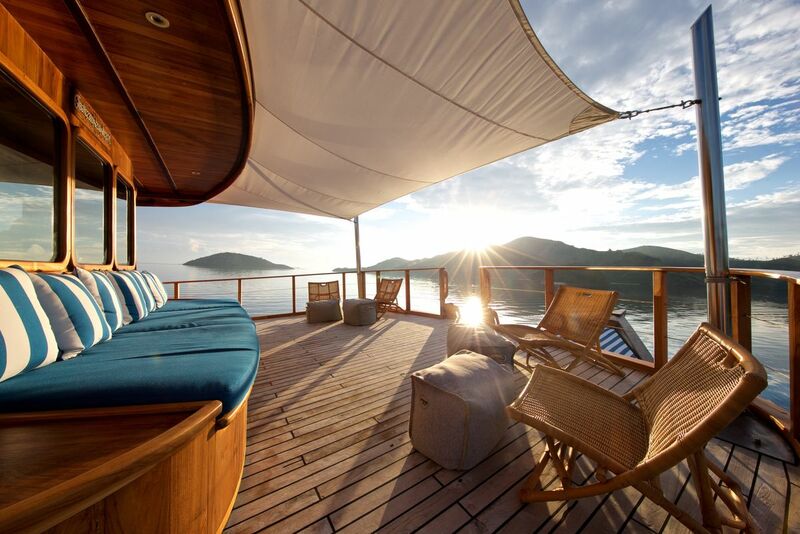 Alila Resorts’ Purnama (Full Moon), Aman Resorts’ Amanikan and Amandira, and Silolona Sojourns’ Silolona and Si Datu Bua are among the yacht charters operating in the luxury segment. 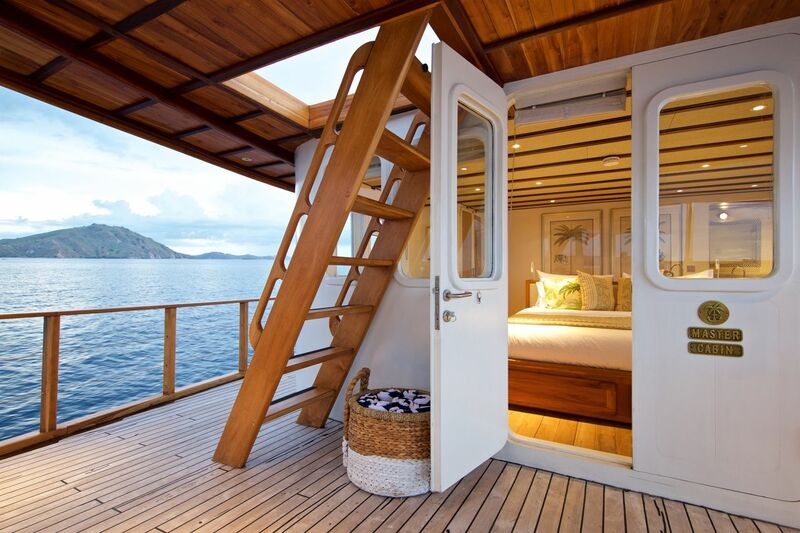 The latest addition is Rascal Voyages, which operates the luxury phinisi Rascal. 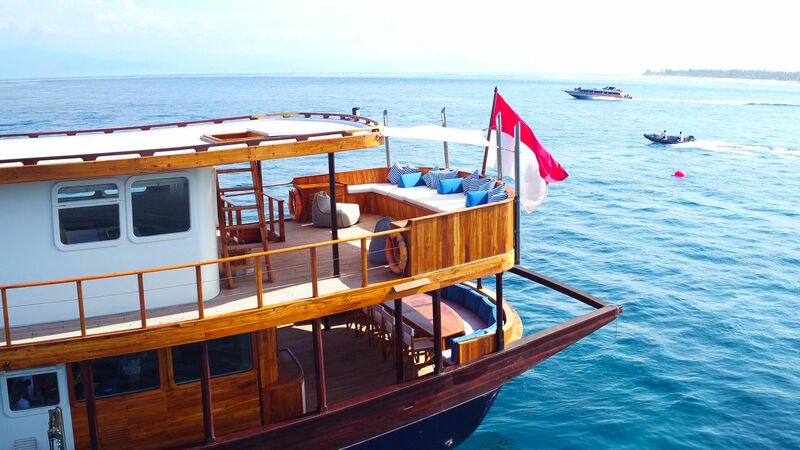 Launched in Indonesia in March last year, Rascal is the youngest phinisi yacht crisscrossing Southeast Asia. The 100-foot wooden vessel was crafted with centuries-old techniques that have changed little given the continuous production of traditional sailing boats. Although the phinisi still plays an important role in inter-island domestic trade, a growing number of them is being purpose-built for tourism, to provide accommodation to leisure travelers and adventure divers. Maritime references say that the phinisi developed from the perahus that Bugis boat-makers produced in the 14th century, and the western schooner that the Dutch introduced to colonial Indonesia around the 18th century. The vessel that we know today has sturdy wooden hull and deck, typically of ironwood and teakwood, two top sails and two tall masts that make up a ketch rig. Five other sails can be hoisted on the phinisi to make up a total of seven. To encounter one at sea, with all its sails unfurled, is indeed awe-inspiring – even though most phinisis today are mechanized. Instead of sails, Rascal runs on a 450-hp propulsion engine with a fuel capacity of 11,000 liters, and a cruising speed of 10 knots. Doing away with masts freed up spaces on the bow and stern where seating has been fitted. It also made possible a large flat roof that doubles as a stargazing deck. Rascal is fitted with two 52kV generators for all power needs, and a desalinator that supplies 4.5 liters of fresh water per minute. If there is a phinisi that’s built for luxury travel, this is it. Recently, Rascal began a partnership with Conservation International to help raise funds and awareness in support of the marine ecosystem in Raja Ampat, a destination it visits with frequency, and a haven for marine biodiversity. The vessel also takes marine biologists and conservation experts to research expeditions. 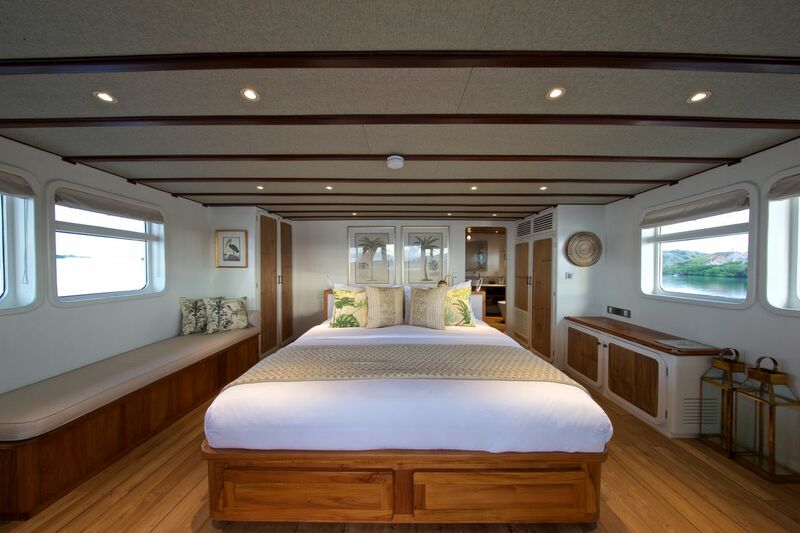 Rascal has five accommodations, all en-suite, including one with an extra bunk. I was offered the principal suite located at the stern, but gave it up as I was on my own, and chose the portside suite instead right behind the bridge. From time to time, I visited the bridge to chat up whoever was on duty, expecting to be entertained with tales of breaches and mermaids, only to walk away with real-life stories of struggles and triumphs, no less heroic, told in earnest. Although constant, the scenery from my window was stunning that I kept my blinds up. Mountains that seemed craggy from afar were on close view covered with dense ground-hugging growths the color of muddy sheep. At first it didn’t matter where we were – the brown mountains surrounding us all looked the same, but after a while we began to distinguish their shapes, and could tell Sebayor Kecil from Sebayor Besar and the massive Flores Island, which the Portuguese named for the flamboyant fire trees that once covered its eastern portion. The only time I left the boat was to join the others for a hike up the hill on an island teeming with Komodo dragons, venomous snakes, and other wildlife – our foot guide informed us dramatically. I was not sure what possessed me to do it, but there I was, panting and cursing under my breath on the arduous ascent to the top where the views – if one were into such so-called rewards – were more than picturesque. Most days passed with everyone spending the hours underwater, surfacing with stories they would doubtless repeat to whoever would listen, or jumping from the roof to the water again and again until the perfect social media photo was in the bag. 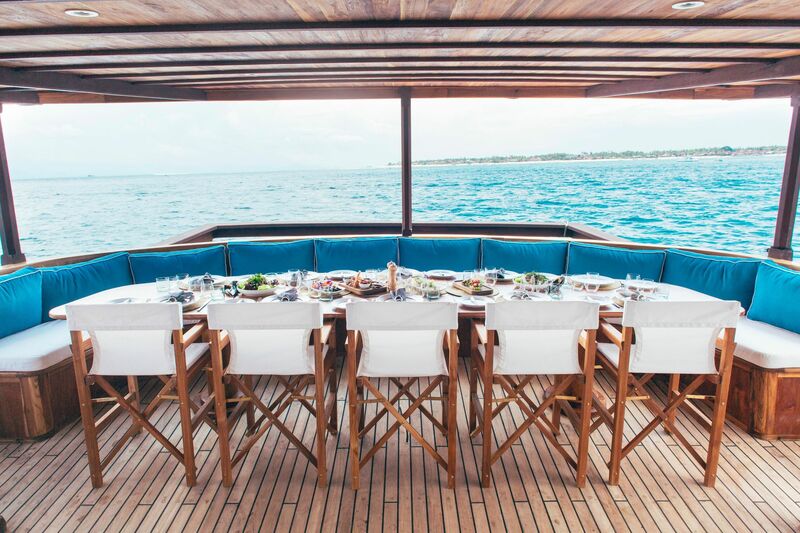 But I was perfectly happy spending time with the staff, watching them enjoy cartoons in their quarters below the deck, learning about the elaborate dishes that emerged from the huge kitchen, and trying every cocktail on the list at the bar. At night we sought sheltering lees and dropped anchor, and spent hours after dinner on the roof to look at the stars, horrified and amused by our ignorance of the constellation. By the time we returned to Labuan Bajo the port was littered with vessels, from luxury yachts to beat-up bumboats and showy phinisis. We discovered from a distance that new resorts were rising on either side of the still nondescript port. Change has come. Behind us the midday tide is low and calm, and the islands incredibly still.